"When I see three oranges, I juggle; when I see two towers, I walk." --Philippe Petit, on why performed his incredible stunt. A good film envelopes you in the experience, and makes you forget you are sitting in a theater, watching a movie; you are part of the action. A good historical documentary goes one step further, and pulls you into the past. It not only makes you an expert on the subject it is chronicling, but makes you feel as though you lived the event, and have a connection with those responsible for the event. Man on Wire is an amazing example of this. It tells the story of Philippe Petit, the man who walked on a tightrope suspended across the twin towers of the World Trade Center. The film pulls you so completely into this historic event that, despite the towers being on-screen for much of the film, you forget about the eventual fate of the buildings. The film doesn’t mention the attacks in 2001; it is a celebration of the fantastic inspiration they provided to people like Petit. It allows us to remember the brilliant majesty of the towers, and is an incredibly uplifting story. And what a strange, unbelievable story it is. The tale of Petit, his crew, and the immense challenge that lay ahead of them is one with so many twists, turns, and suspense that if this were a work of fiction, it would teeter on the edge of incredulity. The most amazing thing about the film is that the story is true. The story plays out like a heist film; Petit’s dream is to walk across the towers on a tight rope. He starts out alone, flying from his home in France to New York and ‘casing the joint’ multiple times. He begins to build a crew, made up of his closest friends. They travel to America and begin to plan the job, gaining a few experts in the elements of the plan they are unfamiliar with, and eventually an ‘inside man.’ They get fake I.D.’s, costumes, the whole nine yards. Yes, the story is akin to classic heist films. But Petit and his friends weren’t trying to steal anything. To Petit, it was a personal challenge; to his crew, it was the chance to see something that had never been done before. The story itself is amazing, but even the best of stories can be rendered boring by a poorly-made documentary. 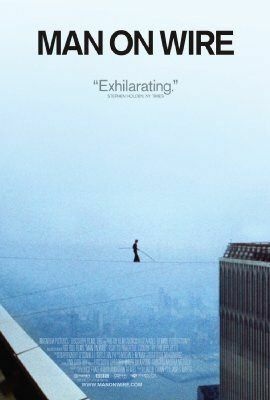 Thankfully, Man on Wire is one of the most well-done, creatively realized documentaries that I’ve ever seen. Petit himself serves as a sort of narrator. He and others involved all filmed testimonies for the movie, with Petit being the most animated, energetic speaker of the bunch. He doesn’t just tell his story; he performs it. All the testimonies include some humorous moments, and parts of the story are hilarious in their own right. The narration is set to archival footage and pictures, as well as dramatic recreations of scenes. The actors who recreate certain scenes don’t talk; it’s like moving illustrations. Some of the archival footage on display is marvelous, like an old interview with the cop who arrested Petit after his stunt. All these elements are put together in a way that can only be described as “edge of your seat.” One only needs to look at the film’s poster to know that Petit succeeds, but that doesn’t stop the film from having incredible tension throughout. Early on, Petit describes the job as impossible, which is certainly true. Simply getting the cable to the roof and stretching it 200 feet across the towers seems impossible, but the actual act of walking on that tightrope seems even more unbelievable. Good documentaries tell a good story; the best of those make you shake you head in disbelief, wondering how everything you’re seeing could be real. Man on Wire is an achievement for this reason above all else. Everybody should have a great time marveling at this story, which is told with a flair deserving of the tale. The film is currently playing at the Landmark Chez Artiste Theater, and I highly recommend seeing it as soon as possible.